I look around me on and I do a double take. People sit outdoors enjoying the warm weather, the streets are busy and restaurants buzz with activity. It's late this Sunday night but you wouldn't know it and it looks like a Saturday night everywhere else. We'd just eaten our fill at a barbecue restaurant nearby but wanted a change of scenery for dessert. Belinda suggested Cheeky Chocolate because it was nearby and without a moment's hesitation, all three of us were headed there. 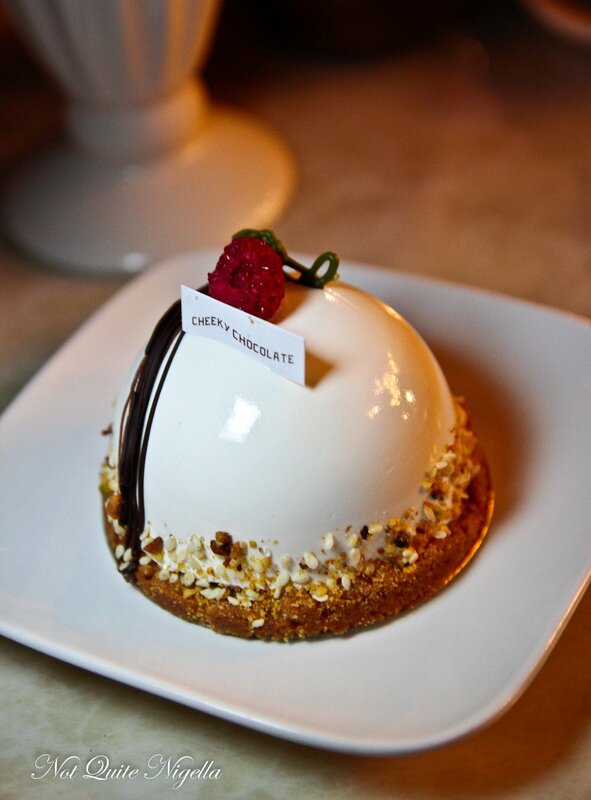 Desserts at Cheeky Chocolate are by Adriano Zumbo and his team. 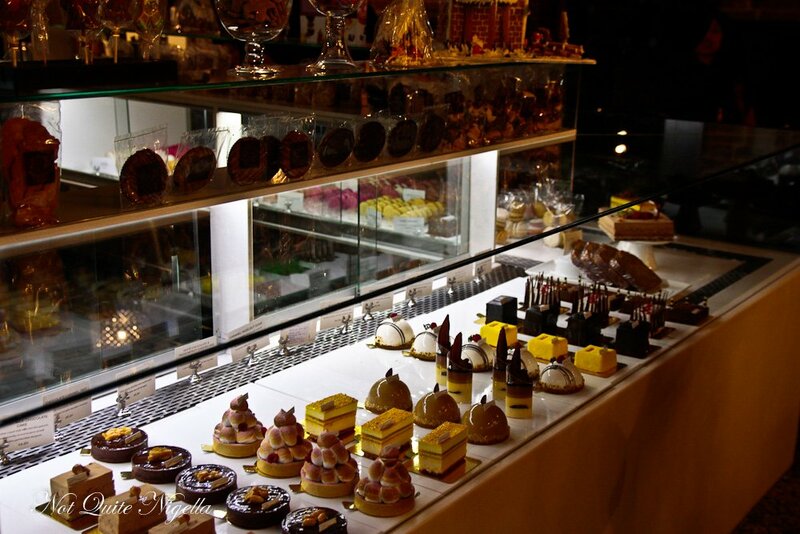 I recall visiting here during my story on A Day in the Life of Adriano Zumbo and he would go through ideas with the pastry chefs here and give feedback on any ideas that they had come up with. 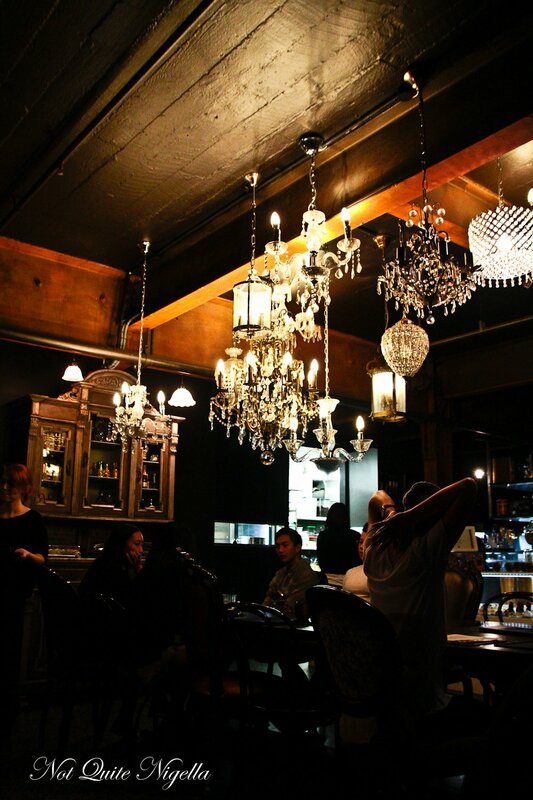 There is a display of cakes in the front cabinet and the decor is feminine with plenty of chandeliers and lights suspended above a large table. Velvet couches create small spaces for groups and there is a mural of Betty Page type holding a piece of cake in the back corner. You can order at the counter or there is also table service. 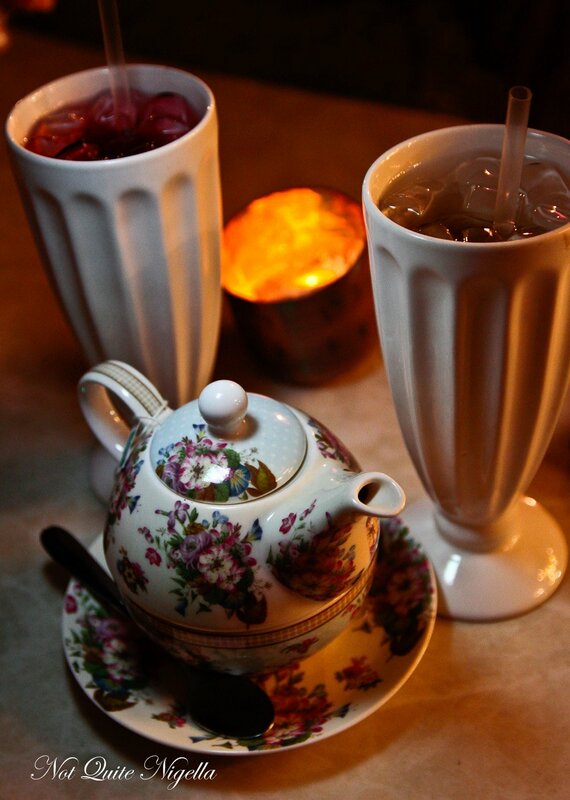 Belinda and I go for some iced teas while Nick opts for a digestive peppermint tea. When I ask the waitress if the teas are sweetened, it stumps her a little. The upshot is that they technically don't sweeten the teas but T2 possibly do. It arrives and it is really quite sweet. It was a warm night and we were after something refreshing and cooling so we went for the sundae. At $18 it's not an inexpensive sundae and comes at a high end restaurant price but it is very good indeed. 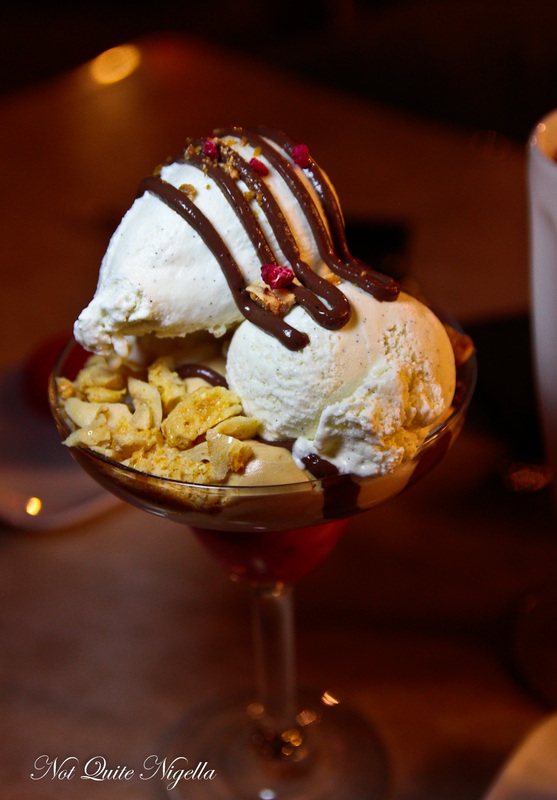 It's a vanilla ice cream and banana gelato sundae with honeycomb, creme chantilly, caramelised peanuts, honeycomb chunks, chocolate sauce with a bottom layer of raspberry gel that you really have to dig into to get to but it is worth it. 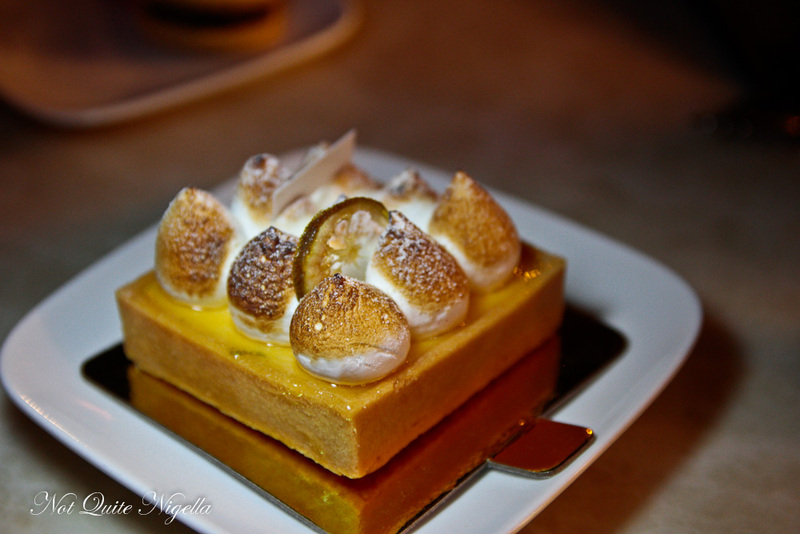 The cakes here are less elaborate than some of the Zumbo creations and we like the idea of a simple lime tart. The base is rich and buttery and the lime curd is smooth with just the right amount of tartness to it and the piped meringue is a creamy, sweet topping. The raspberry bom is perplexing. Although it looks pretty, it's actually very indistinct in flavour and we thought that the white chocolate and raspberry would be a great combination. Instead, we leave most of this as the white chocolate is mild and there is such a tiny amount of raspberry. As all of us are peanut butter fiends having discussed the merits of the humble peanut already that evening. So we decide to try the salted peanut butter macaron. The peanut butter and jelly flavour is somewhat lost against the chocolate ganache filling. We would have loved a simple peanut butter and jelly filling without the chocolate or a peanut butter ganache instead of the bittersweet chocolate ganache. 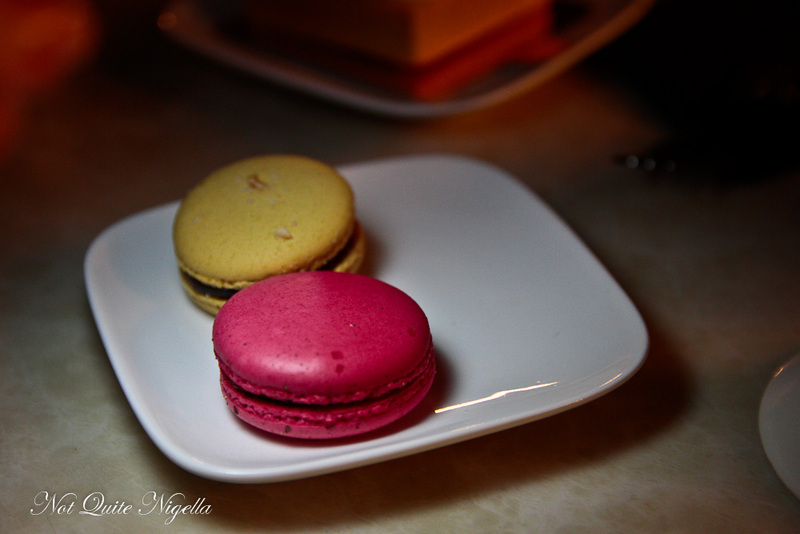 The chilli chocolate macaron has the flavour of chilli but without the heat. As we leave we can't help but notice that the party is still in full swing in Strathfield with plenty of people milling about and our table is soon snapped up by another group. So tell me Dear Reader, do you like a change of scenery for dessert? And do you go out on Sunday nights much?